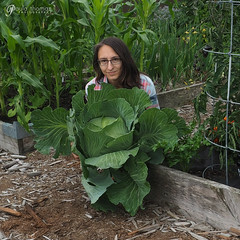 I have been growing a wide variety of fruits and vegetables in the garden the past couple of years and have a few favorites I wanted to write about that I'll definitely grow again and think you should try too. I prefer the hard neck varieties of garlic because I enjoy the garlic scapes in the Spring which the soft neck varieties don't produce. 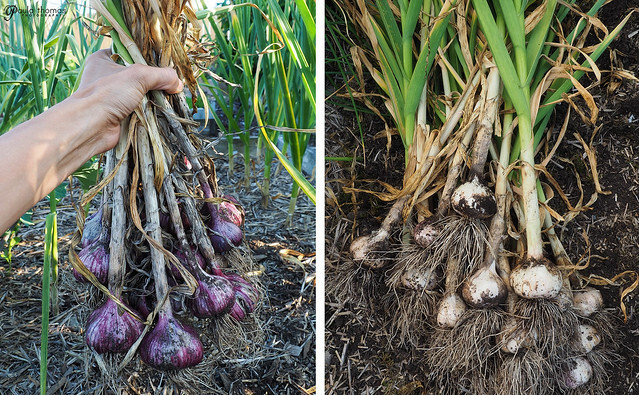 Turkish Giant - This hard neck purple stripe variety has large cloves but is not an elephant garlic. It has great strong flavor and stores well. 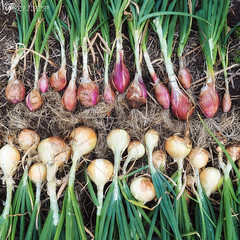 Tropeana Lunga - These are an intermediate day type of onion. I've grown this one for the past 2 years and will be growing it again next year. It's an oblong pretty pink onion that tastes more like a shallot than an onion. Great sliced thinly and added to a salad. It doesn't store that well so it's best eaten within a couple months of harvesting. Ailsa Craig - This is a long day type of onion so best grown in Northern part of the US. These can get very large which is why I like them so much. I thought they were a long storing onion but after some research found they aren't. I never grow enough onions to verify that. It seems I never grow enough onions and plant more every year. Brunswick - This was my first year growing this variety and was impressed. I usually only plant 2 or 3 cabbages because they take up so much room. I grew two of these and they both were very large and didn't split. The larger one was over 11 lbs after removing the outer leaves. This variety makes great kraut. I will likely grow it again next year. Pellegrini (Monachine) - This is an Italian pole bean that has been grown in the PNW for many years and is adapted to the climate here so I'm not sure how well it will grow in other climates. It's a very tender, stringless green bean. The amazing thing about this bean is that even when the bean gets too big that you'd think it wouldn't be tender, it still is! This is also a great dried bean as well. 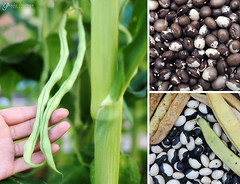 Fortex - This is a long pole bean, not as long as a yard long bean but they grow to about a foot in length. They are round and very crispy and sweet, also stringless. They would make a great casserole bean or canning bean. Ying Yang (Calypso, Orca) - These are bush beans that can be eaten as fresh green beans but they are best known for harvesting when dried. They are great in soups and salads. They are easy to grow and very productive. They have a beautiful black and white pattern which disappears after its cooked. Bob's Red Mill also sells this variety which is available in some stores or on Amazon. Lemon - A yellow baseball sized cucumber that looks more like a melon. It is great in salads and also pickled or eaten like an apple. It doesn't taste like lemons but it has a sweet flavor. The vines are very productive. They are bested harvested young, before they start turning dark yellow/orange. Mexican Sour Gherkin (cucamelon) - A very product vine that produces tiny watermelon looking cucumbers that are slightly sour. They are great to just snack on while walking around in the garden. They're also good in salads or pickled. I've not grown that many varieties of peppers but every year I try more and more so I'm sure my list of favorites will grow every year but these are my favs from the garden this year. Lunchbox - These are like tiny red bell peppers. They are crunchy, sweet and juicy. I loved stuffing them with a mixture of goat cheese and cream cheese. They work great for anything you would use a red bell pepper for. The plant produces a ton of peppers, much more than I would get from a regular bell pepper. Orange Scotch Bonnet - These look similar to the lunchbox but pack a punch. They are very juicy and crunchy and have a fruity taste. The walls of the pepper aren't spicy at all but once you get to the core and the seeds, they are quite spicy. The plant is also very productive and was the only pepper that lasted in my greenhouse all the way to December. Padron - These are typically harvested green but they do turn red if you let them. I learned about these peppers from a local pizza restaurant that has a seasonal padron pizza. Many of the peppers are pretty spicy but some are more mild. They are great for using in salsas, fried potatoes, burgers, just about anything. Giant Jalapeno - This is the only pepper plant I didn't start from seed. I got the plant from a local gardener and he insisted I grow it. I was not disappointed. This plant produced some huge jalapeno peppers that weren't overly spicy. I also enjoyed these stuffed with goat cheese and cream cheese and toasted on the grill. They are also great for salsas too. I've been growing about 20 varieties of tomatoes for the past couple years and these are some of my favorites that I'll grow every year or at least grow again in the near future. Black Beauty - A large gorgeous black tomato that is super sweet too. The first fruits are usually the largest and the sizes get smaller as the plant grows. It does seem to take longer than most tomatoes to ripen. Japanese Black Trifele - a very productive and tasty tomato. Seemed to be the most blight resistant of the heirloom tomatoes I grew this year. It has a beautiful dark red color and all of the fruits were about the same size. Sungold - The sweetest cherry tomato I've grown and will continue to grow it in the garden every year. The variety I have has been dehybridized which means seeds can be saved from the fruit and grown again and will be true to type. Black Cherry - Another super sweet tomato that is a deep purple and another favorite that I enjoy in the garden every year. Chocolate cherry is similar but the black cherry seems just a little sweeter. Ardwyna - This is a huge paste tomato, much bigger than any roma I've ever seen. It doesn't take many of these tomatoes for a batch of salsa. The taste is also great for a paste tomato. They are best used in salsas and sauces. 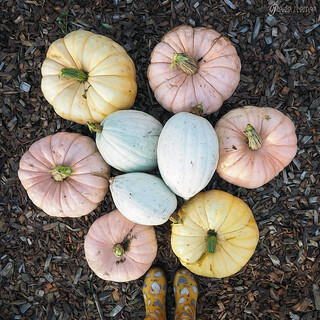 Porcelain Doll Pink Pumpkin - This was my first year growing pumpkins and was impressed by the productivity of just one plant. It grew all the way around my raised bed and produced 6 good sized pumpkins. They are yellow when immature and turn a light pink when mature. This is a hybrid so saved seeds may not produce what you would expect. It has a sweet flesh, great for making pumpkin pies. This variety is said to be resistant to powdery mildew. It is a hybrid seed I got from a seed swap so I don't think saving seeds from it will produce the same thing but I might try it. We grow all of these, except squash. By the way, we enjoy most growing beans, potatoes, cucumbers, tomatoes and onions.